No landscape design is complete without proper lighting. It not only improves visibility and allows you to navigate through the backyard safely, but also enhances the beauty of the landscape. Most landscapers actually consider outdoor lighting one of the most important aspects of landscape design. At Ivy Studio, our landscape designers have set up excellent luxury landscape lighting systems on properties that make the outdoors just glow at night. With a great backyard lighting plan in place, our clients are very satisfied with how their property looks after the sun has set. Why Is Outdoor Lighting Important? It can hide or disguise the more undesirable aspects of your property. For example, if you have an ugly shed or device in your backyard, you can keep that area unlit and hide it in the shadows. Exterior lights can highlight the best features of your landscape like trees, boulders, gardens, and, fountains. They can brighten stairs, walkways, paths, and other such features to make navigating through the property easy during the night. Ambient patio lighting can bring attention to your home and highlight its architecture as well. We plan the landscape and patio lighting carefully after we understand your requirements and preferences and assess your property. We take a large number of photographs of your landscape and garden and single out which features to highlight and which features to disguise. This helps us create a great design and system that will bring out the best in your property. Low-quality fixtures can be a hassle to deal with because they break down and cause problems regularly. 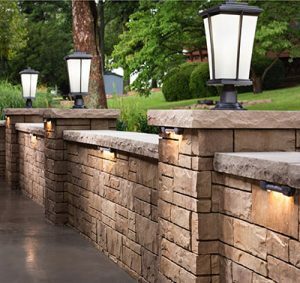 We only install landscape and patio light fixtures that have proven to be resistant to outdoor conditions and work well in landscaping. You won’t have to worry about replacing them every time it rains a little. Experienced landscaper designers know there are many different ways to use lights to create different effects. This can include up-lighting, down-lighting, moonlighting, grazing, path lighting, shadowing, washing, cross-lighting, spotlighting, and underwater lighting. These unique patio and landscape lighting effects can create an air of mystery or add a glow to your landscape. We know which effect would be suited for different areas of your landscape and plan accordingly. For example, up-lighting can help create an aura of mystery and make large boulders look even bigger. Contact your Massachusetts landscape designers today for excellent ambient and landscape lighting services. We are the experts that provide comprehensive landscape and patio lighting solutions, as well as full-service landscape design and install. You can contact us at this number, 781-591-0300, or alternatively, you can also use our Start a Project form to send us details of your requirements and we will provide you the solutions you need.